Samsung Galaxy S6 Edge Plus may have a new and different accessory. The accessory is Physical keyboard. This news is a rumor and it is not yet confirmed that there will be a accessory like this. Samsung is upto something, we would know that in during the Launch. 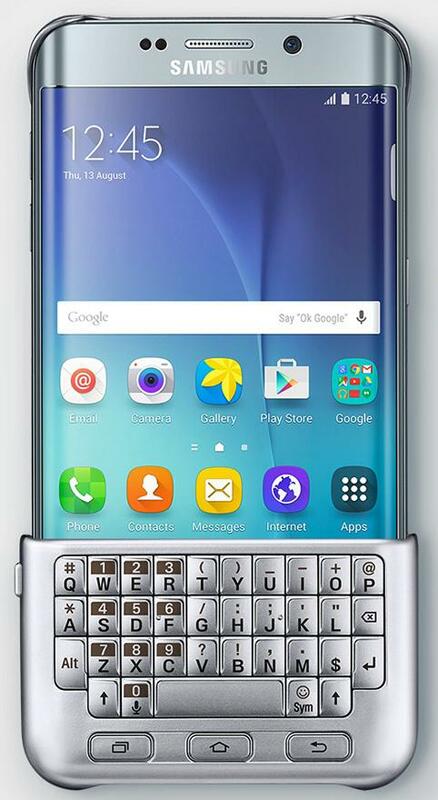 [at] evleaks in twitter posted a pic of the Samsung Galaxy S6 Edge Plus with a physical keyboard. You can see that below. Seeing the image, we can pretty much say that it is a qwerty keyboard, which can speedup your typing and the design is not looking impressive. So look at the image once again, the accessory looks like metal, so it can be, we don't know about that now, will see that later. Samsung always tries some wired and interesting things, so we might see it coming. Like we didn't beleived in curved display, but Samsung introduced Galaxy S6 Edge and it is a big hit. So we would be updating you with the news further, so as always Keep visiting, Stay updated.